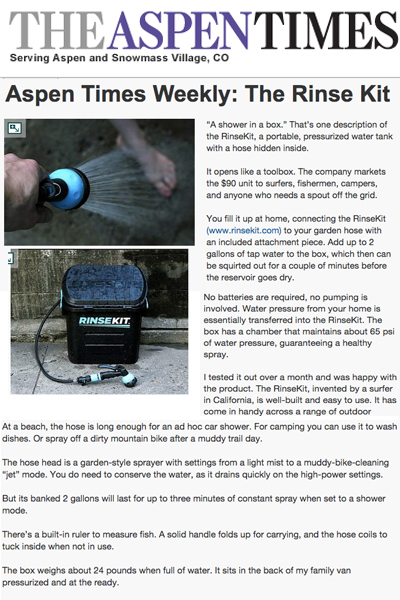 The Aspen Times reviewed RinseKit. © Copyright 2016 - Kobal Group Inc.
RinseKit® is a registered trademark of Outsol, LLC. Other trademarks include: Rinse It, Hose to Go, Shower in a Box, Spray it - Wash it - Rinse it, No Pumping No Batteries, Pressurized Portable Shower, Pressurized Portable Sprayer, Eon, 2 gallon pressure chamber.